The recent energy efficiency enhancements within the National Construction Code have targeted the reduction of heating and cooling energy required to maintain accepted levels of thermal comfort with new housing. A mixture of market demand and further enhancements to the thermal performance regulations will further increase thermal comfort expectations within new houses in Australia's diverse range of climate types. To date, this has resulted in warmer internal temperatures and lower heating bills within Australia's temperate and cool-temperate climates. The warmer internal conditions are due to the combination of a more thermally effective built fabric, the relatively low cost of energy and the ready access to after construction heating and cooling appliances. However, many of these warmer homes are presenting new problems. The appearance of condensation and mould within homes, some within four weeks of occupation, is showing a general non-awareness of vapour pressure management within the Australian design and construction industries. 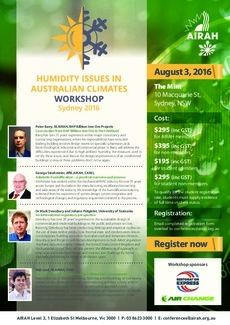 The paper will discuss recent experiences of mould and condensation in new houses in Tasmania. With the support of Building Standards and Occupational Licensing, university researchers have worked with and advised government, design and construction professionals and home owners on aspects of built fabric and ventilation to assist in vapour pressure management and the minimisation of condensation risk within new buildings. Specifically, this paper will also discuss case study experiences from three new houses in Tasmania. 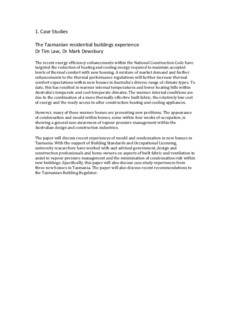 The paper will also discuss recent recommendations to the Tasmanian Building Regulator.